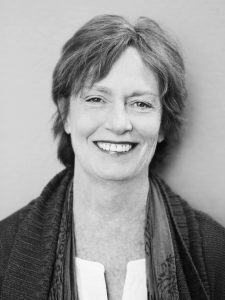 Training: Catholic University, Uta Hagen, Shakespeare & Co.
Kate Kelly has spent thirty years working in the theater as an actor and a teacher. In a career, beginning with the national tour of FINISHING TOUCHES by Jean Kerr (starring the legendary Barbara Bel Geddes), she has performed throughout the country in theaters such as Hartford Stage, Philadelphia Drama Guild, Delaware Theater Company, Portland Stage, American Stage Festival, the Folger Theatre. She has performed in three National Tours and was a part the Broadway productions of THE UTTER GLORY OF MORRISEY HALL and the Jose Quintero revival of THE SKIN OF OUR TEETH. Off Broadway: Circle Rep, Playwrights Horizons, The Hudson Guild and St. Clements. A founding member of Capital Rep and it’s predecessor, Lexington Conservatory Theater, Kate appeared in over thirty productions from 1976 – 1995 with these two organizations. A sampling of roles include Annie: THE NORMAN CONQUESTS, Shelia: JOE EGG, Sally: LIPS TOGETHER TEETH A PART Kate: DANCING AT LUGHNASA, Bananas: THE HOUSE OF BLUE LEAVES, Peg: PEG OF MY HEART, Millie: PICNIC and Timothea: SEA MARKS. Kate has been a part of the Theater faculty at Skidmore for over sixteen years. She trained for four years with Uta Hagen and studied extensively in many Stanislavski-based techniques. Recently, she has joined the faculty of Shakespeare and Company and has participated in numerous voice workshops at The Linklater Center.